When I was an undergrad taking my probability and statistics course, I was definitely in “memorize equations” mode. I didn’t really understand why sometimes we divided by the square root of n and sometimes we didn’t for the z- or t-score. I got an A in that class, but I really didn’t “get” it. For instance, if I have a population about which I want to know something, I usually can’t test it in its entirety—the population might extend into the future, so how am I going to test that? 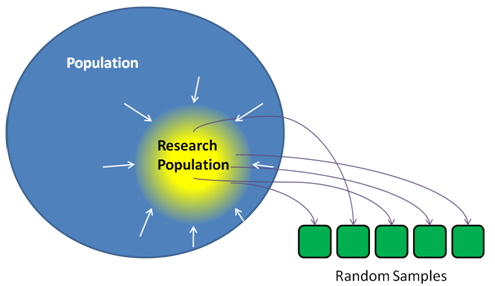 Instead, I work with what I have, a subset of the population called the “research population,” from which I can sample. I sure hope the research population does a good job representing the population, otherwise I lack external validity for any conclusions I make. Well, that research population is still pretty big, and I really don’t want to sample all production for this month, so I take a sample from the research population. This sample can be grabbing the top 10 in a box, in which case I have no guarantee that the top 10 weren’t the lightest or whatever; or I can take a random sample and hope that the sample represents the population. There are a number of clever ways to get a random sample but that might be a topic for another article. At this point, if I have taken a good sample, my random sample tells me something about the research population, which tells me something about the population as a whole. It’s kind of roundabout, I know, but the alternative is measuring the whole population, which isn’t really an economically viable alternative. Now I get to calculate some numbers that are related to three of the four aspects of any data set that we need to know: shape, spread, and location. (The last one, stability over time, is shown via a control chart.) 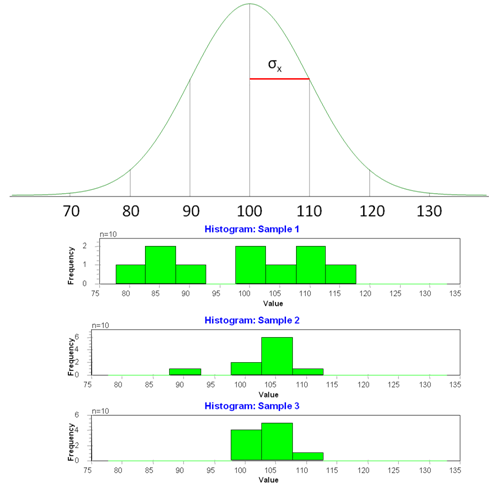 Because these characteristics are calculated from the sample, we call them “statistics,” and they could include skewness and kurtosis (i.e., shape); range, standard deviation, and interquartile range (spread); and mean, median, or mode (location). But I don’t really care about the sample—that bus has come and gone. What I care about is the population. So I need to know how the statistics are related to the population parameters, which is what I really care about. Once I do know, I can make some inferences as to what those parameters are. If I messed up at some point in the chain, then everything from that point forward is pretty suspect. However, I don’t want to spend the rest of my life taking a bunch of samples; I only want to take one sample. If we can find some relationship between the samples and the population, then maybe I can get away with using fewer, maybe even using only one. I simulated only 15,000 means, but it should be pretty close to the random sampling distribution, which is all possible means of the given sample size of 10. Now I see a much narrower distribution than I saw on the BHD or any individual sample (figure 3). It makes sense because I’m making a histogram of the means of each sample, right? So why do I care? Because any time I take a sample of size 10 from my population, the average of it is going to fall on that little RSD distribution. That RSD for the means tends to be normally distributed, regardless of the shape of the population—if the sample size is large enough. And because the normal curve is defined by the mean (which we know) and the standard deviation, that only leaves one more step before we can fully describe the RSD of the means. We see that our standard deviation is again pretty close to what we would have expected. For a sample size of 10, d2 is 3.078. If we take our average range and divide by that, we get 10.04, again pretty close to what we know σ to be. 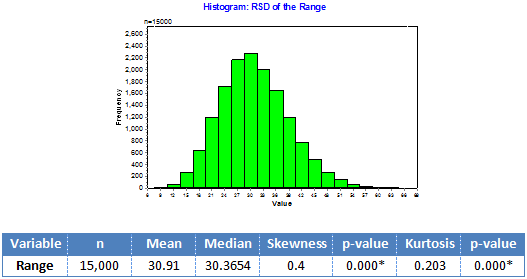 Now let's look at the RSD for standard deviations. 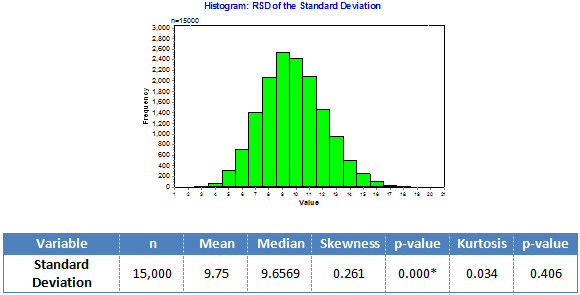 Notice how the mean of the RSD of the standard deviations is pretty far off of the real value? That is why the average standard deviation is a “biased” measure. The RSD for the variance, though, is unbiased. Weird, huh? It is positively skewed. (Get it?) Remember this from SPC, though? For a sample size of 10, c4 = 0.9727, so using our average we would estimate σ to be 10.02. 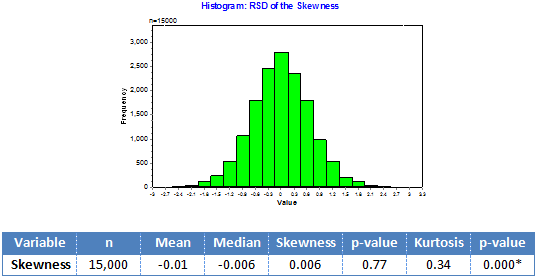 The RSD of the skewness looks to the eye to be normal-shaped, which is why we never rely on our eyes to do statistical tests. It is symmetrical, but it is leptokurtic, not normal. This is an unbiased estimator, so the average skewness is pretty close to the zero that we know it to be. 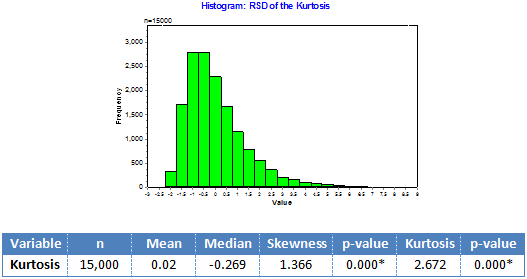 The RSD of the kurtosis is positively skewed and is very leptokurtic. It, too, is unbiased, so we are pretty close to zero. Again, why do I care? Remember, the RSD are theoretical distributions of every possible sample of size n for a given BHD, and I can build one without even taking a sample. Then when I take a sample, whatever sample I get is somewhere in that distribution if I knew what that BHD really was. This is the basis for hypothesis tests. Looking at all the goofy shapes of the RSDs above, you can understand that there are going to be different tests for the different parameters. Also, once we get a sample, we can bound the error of the parameter estimate if we understand the RSD, which is where confidence intervals come from. 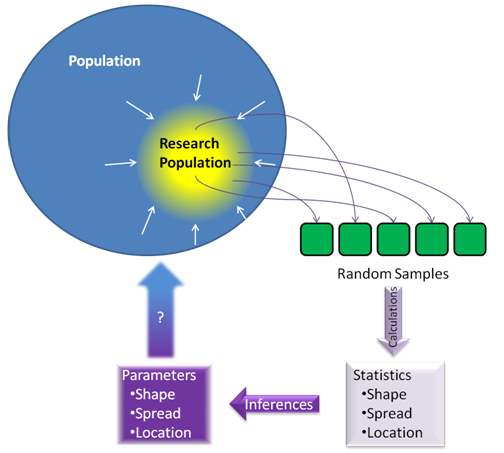 So the idea of the RSD underlies just about everything in inferential statistics. And yet, in my experience, people who use statistics daily often have no clue what an RSD is. That means they are probably making very costly mistakes without ever knowing it. Do you want to see how the RSDs are used? Tune in next month.